Visit Eurocamp more than twice this year and you can save yourself hundreds on your next holiday. If you book a getaway in August you can enjoy even more savings too. With Eurocamp, your loyalty's appreciated. Book a holiday more than once and save 5% on your booking each time you return. Book your whole holiday now, even if you don't have the funds, and pay for the majority of it a few weeks before your stay. All you have to do to secure your getaway in the meantime is pay a tiny deposit of just £99. Sign-up to Eurocamp Newsletter for Special Offers! Make sure you get to hear about all the latest money saving deals as soon as they become available so you can secure the accommodation that you want at the best price. 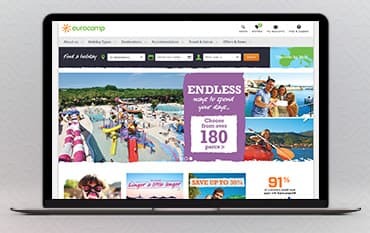 Where do I use my Eurocamp voucher code? 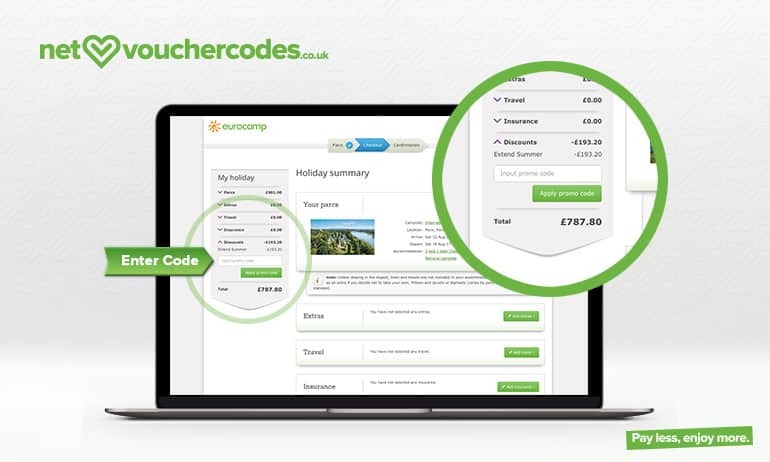 Select the voucher you would like to use on NetVoucherCodes and click ‘get code’. Follow the link to the Eurocamp website. Select your preferred destination and dates. Enter your party size details. Click book to proceed to payment. Enter your promo code on the left under the My holiday panel. "Why not go on holiday with friends or family? You can easily split the cost of your accommodation & travel. Eurocamp holiday homes are perfect for two families, or groups of couples sharing – even better, you only pay a single price for the accommodation, rather than per person." At Eurocamp, you can book a wide variety of camping holidays throughout Europe, from mountain lodges and bungalows to mobile homes and tent pitches at over 170 parks and sites across the continent. You’ll be able to enjoy the freedom of traveling and you can stay and spend your time however you want! You’re truly spoilt for choice with a Eurocamp holiday, and with an added discount or voucher code, your Eurocamping holiday could cost you considerably less! Whether you drive, fly, hop aboard the Eurostar or chill out on a ferry; the wide variety of options means you can pick exactly the kind of experience you want. There are all sorts of amenities and facilities to enjoy whilst Eurocamping, each park is unique in the experience it offers, they’re all united in providing family fun experiences, with great dining options, kid’s play areas, pools, shopping and more common to the lot. Many parks can be found in enviable locations including France, Spain, and Portugal, but if you fancy going further afield there are also resorts in Italy, Holland, Germany, Denmark and beyond. For an exciting family holiday with a difference, take a look at our great Eurocamp offers. Eurocamp has travelled across Europe to discover some of the best locations for Eurocamping holidays! Get set to explore 13 countries, over 35 region and over 180 campsites! With Eurocamp, you’re truly spoilt for choice so whatever your preference, you’re sure to find a location you love at a price you can afford. Choose from exotic destinations including the Alpine charm of Austria, the outdoor delights of Switzerland or the fabulous Lake Guarda in Italy. Feel the mix of the Mediterranean in Croatia or relax in the easy-going atmosphere of Holland. Perhaps you’re seeking some much-needed sun? If so, Touch down in Spain, the ultimate European holiday destination or soak up the tranquillity of the stunning sandy bays in Portugal. If you’re the more cultural type, enjoy the best of gorgeous weather combined with adventure and culture in Italy & France. Whatever your choice, you are sure to find something you love with Eurocamp, so start your search today! France is a land made for exploration from the North to the South; it’s where discoveries are made and varied cultures merge. Delve into a whole world of culinary delights or enjoy the sensational outdoors. France is a great place to start on a camping holiday, and with Eurocamp, you can do just that! Along with our great offers & discount codes, you could be soaking up the French sun for less. The spectacular North of France is the perfect destination for those who love to combine fun and adventure! Visit the marvellous Disneyland Paris where dreams really do come true or take a stroll down Brittany’s charming coastline. If you are after a spot of tranquillity, pause for some thought in Normandy as you absorb the stunning landscape. When heading into the centre of France, revel in the majestic, medieval Dordogne or enjoy the great outdoors in Jura, home to a miraculous 31 waterfalls. The land of endless great grapes in the beautiful Burgundy is the perfect destination for wine lovers who are really seeking to get a ‘taste’ of central France.Looking for a different type of holiday in France? The south of France is home to fantastic outdoor adventures, so why not get stuck in with a touch of surfing in Gascony, Hiking in the Pyrenees Mountains or canoeing in the Ardeche? Take a break and try France's answer to the Spanish Costas in Languedoc & Roussillon and soak up the Mediterranean sun. With a wide choice of campsites and holiday homes to choose from, France is the perfect destination for an adventurous family getaway, couples retreat or just some fun with friends. There is far much more to Spain than the just its succession of glorious beaches. While Spain is rightly worshipped by sun-seekers from near and far, making it the perfect camping destination, it is also a land rich in culture, perfect for those with historical and architectural interests. For every golden sandy stretch of beach, there is an equally satisfying, beautiful mountain village. Whether you’re craving excitement or relaxation, Spain boasts the perfect combination of the two which is why there is plenty of fun, adventure & relaxation to satisfy everybody in Spain, whatever your taste! When is my balance due date? Your balance is due to be paid 12 weeks before your departure. What equipment is included in accommodation? Details of the accommodation inventories can all be found in the 'Accommodation' section on the Eurocamp website. What extras can I add to my room? You can add extras like bed linen, towels, welcome packs, beach towels or baby/toddler equipment to your booking through the 'My Eurocamp' section of the Eurocamp website. How can I contact Eurocamp? You can contact Eurocamp by calling 01606 787125. Eurocamp holidays offer a wide variety of camping packages throughout Europe, tailored to your preference and requirements! If this is your type of holiday, then why not take advantage of our Eurocamp voucher codes where we aim to provide all the latest offers & discounts. Whether you’re after a serene seaside break or after somewhere a little more adventurous, Eurocamp can offer the ideal holiday experience to suit your needs. With over 150 locations to choose from, you can be sure to find something you love! Be sure to check here before booking as you could save yourself a pleasant amount of money with our discount codes. We are constantly on the hunt for Promo Codes for Eurocamp to help you with your money saving. Our experts check dozens of sites for secret codes including NHS discounts, student sites & social media channels saving you time & money!